There is only so much space in an Apple Watch for the battery. Apple has done its best to offer maximum battery life by tightly integrating the software and hardware, but most users expect their Apple Watch’s battery to last more than a day of heavy usage. The Cupertino company has been exploring different ways to extend the battery life of its wearable devices. Apple has now patented a new wireless charging case for the Apple Watch that could allow you to easily charge the Watch on the go. The wireless charging case might also be able to charge bands if the bands have electronic circuitry, sensors, or batteries that require power, hint patent documents. It is designed to hold at least two pairs of Apple Watch bands of different lengths, widths, and thicknesses. There have been speculations for a long time that Apple was working on electronically-enhanced Apple Watch bands that would offer new options such as medical sensors. The upcoming Apple Watch Series 4 is rumored to have an EKG monitor. 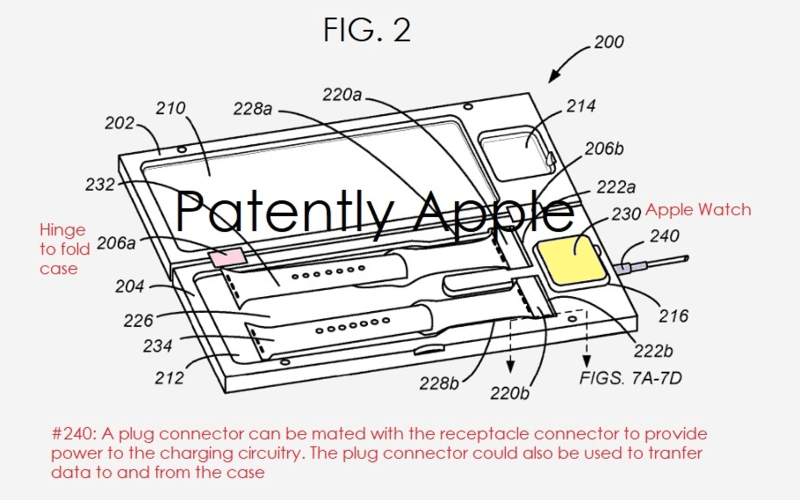 The charging case described in the patent is similar to Apple’s wireless charging AirPods case. It means users will have to charge the case itself. When your Apple Watch runs out of power, you can place it in the case to recharge it. According to images included in the patent filing, the case is rectangular in shape. On the inner left side, there are two rows for two pairs of bands. On the right side, you can see a cutout for the Apple Watch. Users may have to remove the bands to charge the Watch. It would work similar to the wearable device’s existing charging puck. You’ll have to place the Apple Watch inside the designated cradle and close the case to protect the display. You can wear it once it’s charged up. The patent also describes a magnetic “attachment system” to ensure that bands of different geometry are held securely in the case. It will be able to store bands having multiple segments (such as Sport Bands) as well as bands with a single segment (such as the Milanese Loop). The patent does not disclose how many additional charges the wireless charging case would offer. It is too early to say whether Apple will launch the new case with the Apple Watch Series 4. The tech giant patents dozens of technologies every year that never get in the hands of consumers. But Apple realizes that it has to offer a way to extend the battery life on its wearable devices. In just a few short years, the Apple Watch has become a potent force in the wearable device industry. Apple does not disclose the Apple Watch sales figures, but research firm Canalys estimates that the Watch outsold the entire Swiss watch industry in the holiday quarter of 2017. It means the Apple Watch sales were higher than the combined sales of legendary brands like Swatch, TAG Heuer, Rolex, Omega, and others. Canalys estimates that 8 million Apple Watch units were sold during the Oct-Dec quarter of 2017. By comparison, the entire Swiss watch industry exported only 6.8 million timepieces in the same period. The Swiss watch industry witnessed only 2.7% sales growth compared to the same period a year prior. In contrast, the Apple Watch registered a healthy 32% growth. However, the Swiss watch sales for all of 2017 were still higher than Apple Watch shipments. The Swiss watch industry sold 24 million timepieces during the full year 2017, compared to 18 million Apple Watch sales. Canalys said Apple was catching up fast as it registered a 54% sales growth in 2017. The Apple Watch Series 3 alone sold 9 million units last year. The Series 3 Watch comes in a GPS and a GPS+Cellular version. The Cellular version was incredibly popular in the US, Japan, and Australia, said Canalys. The Watch sales were affected in European countries due “limited operator selection”. Apple CEO Tim Cook told investors during the Q4 earnings call that it was the “best quarter ever for the Apple Watch” with over 50% growth in shipments and revenues. Apple’s wearable device saw strong “double-digit growth” in every geographic segment. The upcoming Apple Watch Series 4 is rumored to have a lot of health features such as an EKG Heart Monitor and the ability to detect diabetes, besides faster LTE connectivity.